Rusty water? Sediment particles? These self-cleaning, sediment backwash systems have got you covered. With the ability to filter down to 5 microns, these systems are excellent choices for removing fine particles, dirt, and rust; and, unlike filter-cartridge systems, these systems will not restrict flow or pressure. All sediment backwash systems include filter media, tank, backwash control valve, bypass valve, and free shipping! Easy to service: little or no maintenance. Proven technology used over decades. No chemicals or salt required. Timed backwashes based on flow and/or day of the week. The Chemsorb filter material used in these systems is capable of removing sediment and particles down to 5 to 10 microns in size, leaving your water clear of rust and sediment. Chemsorb is a high purity, low sodium, natural, zeolite mineral (14 x 40 mesh) that has an ANSI/NSF Standard 61 listing. The material is mined, crushed, dried, and double-screen sized to produce a high-quality filter media that has a high throughput capacity at low differential pressure. Compared to filter sand and some other filtering media, you can retain much more water flow with less pressure loss using Chemsorb. The media has surface micro-mineral projections (with 0.25 to 10 µm spacing that effectively traps suspended solids. This, along with the high surface area, make Chemsorb an ideal water filtration media. Quick to install by any plumber or any person familiar with basic plumbing! Connect filter system to piping after your pressure tank using bypass connectors (included at no extra charge) to enjoy sediment-free water. Q. Why are these systems called "Sediment Backwash Filters. A. Sediment backwash filters remove sediment from water and then automatically backwash the sediment out. Q. How do they work? A. The filters contain Chemsorb Filter Media. Chemsorb is a high purity, low sodium, natural, zeolite mineral (14 x 40 mesh) that is classified as GRAS (Generally Recognized As Safe) and has an ANSI/NSF Standard 61 Listing. The material is mined, crushed, dried and double-screen, sized to produce a high quality filter media that has a high through-put capacity at low differential pressure. In other words compared to filter sand and some other filter media you can get more water through it at higher flow rates without as much pressure drop or pressure loss.The alumino-silicate, crystal, mineral material has surface micro-mineral projections with 0.25 to 10 &upsi;m spacing that effectively trap suspended solids in water streams. The surface, micro-projections, together with the high surface area makes this material an ideal, water filtration media. Q.How can I know the Sediment Backwash Filter will work for my water? Is there any guarantee? A. We do offer a six-month money-back satisfaction guarantee. If you currently have a 5 micron or greater cartridge filter and it is working to remove the sediment (but it needs to be changed too often) the system will work great for you. If you have very fine particles less than 5 microns an additional 1 micron cartridge can be installed after the sediment filter. Finally, if that doesn't work and your water is still cloudy, we recommend an ultra-filtration membrane to remove particles less than 1 micron. Q. Do the Sediment Filters remove anything besides sediment? A. The filter granules physically filter and trap the suspended solids. In addition, the granules remove a wide range of colloidal and soluble, inorganic metallic, contaminants by surface sorption, chemical-binding, charge neutralization, coagulation, reactions and/or ionic, ion-exchange phenomena. In short they are good water clarifiers. A. Not necessarily. Turbidity or cloudiness, which are microscopic particles suspended in water may need to treated before they can be removed. The Chemsorb media removes the particles down in the range of 5 to 20 microns, but often times cloudy water has particles that are less than 1 micron. An injection pump injecting a flocculant and a contact tank in front of the sediment filter may be required. You can also use the Sediment Backwash filters as pre-filters and then follow it with an Ultra-Filtration System, a type of fine membrane that removes sub-micron particles. We have excellent results with many customers using UF systems for treating lake water, creek water, or well water high in turbidity. Please contact us for more information on UF systems. Q. Do these systems come in different sizes? A. Yes. The size of the filter system is directly proportional to the flow rate of the water, in gallons per minute. The higher the flow rate, the larger the system required. See our table for the flow rates for Sediment Backwash filters. Q. How do I know which size to get? A. If your well pump can pump 12 gallons per minute, then you can use the 2.5 cubic foot model, which is recommended generally for larger homes of 2 to 4 bathrooms. For most homes with 1 to 3 bathrooms we recommend the 1.5 cubic foot size, which requires a backwash rate of 7.0 gallons per minute. If your well can pump the minimum amount required, the Chemsorb media may not get cleaned properly and the sediment may not get washed out during the backwash. Q. Should I use a prefilter? In addition to fine sediment, I also have sand and grit. A. We recommend a Rusco 60 mesh filter screen should be installed prior the sediment backwash filter if there is very large sediment such as flakes, or sand, or hard sediment such as grit or hard clay particles. Q. Should I use a post-filter? I have very fine sediment that passes through a 5 micron filter cartridge! A. Yes, we recommend a dual-grade 25/1 micron filter cartridge be installed after the Sediment Backwash Filter. This will remove particles down to 1 micron. The Pentek dual-grade filter cartridge holds a lot more sediment than the standard pleated or string-wound cartridges. Q. Why do different models have different flow rates? A. The maximum flow rate in gallons per minute, is dependent on the size of the filter tank, and the type of control valve used. Generally a 1.5 cubic tank is the best size to use for most homes, but if you use a lot of water and have higher flow rate needs, the 2.5 cubic foot works better, assuming the well has 12.0 gallons per minute available to meet the minimum backwash flow rate requirements. Q. During some periods of the year I have a lot of sediment and silt, but other times my water is clear. Will the Sediment Backwash Filter automatically adjust the backwash cycle so it backwashes more during the heavy-sediment time of the year and less during the periods when the water is clean? A. No it won't. However it is very easy to change the days between backwash. The days-between-backwash on the control valve can be changed easily with the touch of a button. Q. Do these filters have any special conditions to work properly? A. Yes. It is very important to have enough flow rate from your well in order to backwash the sediment filters properly. See table above "Choose by Pipe Size" you can see the 1.0 cubic foot size has a backwash flow rate requirement of 5 gallons per minute. If you have any doubt, you can easily test your well flow rate yourself by following the steps on this page: How to Determine Flow Rate for Wells with Pressure Tanks. Q. Will the Sediment Backwash Filters remove iron? A. If the iron is ferric iron, or in other words, visable rust, yes it will remove it. If the iron is dissolved ferrous iron, you would need to install a chlorinator, ozone generator or other oxidizer prior to the Sediment Backwash filter for it to remove all the iron. If you have a lot of iron and sediment, you may want to install the Sediment Filter first, then an iron filter system second to catch all the fine sediment and dissolved iron. Q. Are these systems big electrical power users? A. No. The control valve uses only about 15 watts of energy to run the timer and backwash valve. Q. How often does it backwash? How much water is used for each backwash? A. You can set it to backwash every 1 to 28 days. A typical setting is once per week. A typical backwash is 8 minutes and uses around 60 gallons of water. It is like running a garden hose for 8 minutes and the water can be re-used if desired for watering the garden since there are no chemicals or salt to it other than what is in your well water. Q. What maintenance is required? A. There is little maintenance. Every 4 to 8 years you may need to replace the media depending on your water quality. The Chemsorb filter media easily replaced without special tools or training. Q. Is there a pressure loss through the system? A. When properly sized, the system produces a very low pressure drop at service flow rates, usually around 5 psi. Q. Can I route the backwash water to my septic tank? A. Yes. The backwash water is non toxic and can be routed to the septic tank with no problem. It can also be routed to landscaping, although the backwash is usually very dark and orange, and will stain surfaces. Q. How frequently do I have to replace the filter media? A. The filter media will last for 4 to 8 years depending on usage and conditions. It is easily replaced. Q. I notice in your diagram that you show the Sediment Backwash Filter after the pressure tank. Why can't I install the auto-backwash filter before the pressure tank? A. All backwashing filter systems (such iron filters, softeners, any type of backwash system) must be after the pressure tank because when the backwashing filter goes into a backwash, say at 2am on a given night, there must be pressurized water entering the inlet to the sediment filter, in order for it to backwash properly. 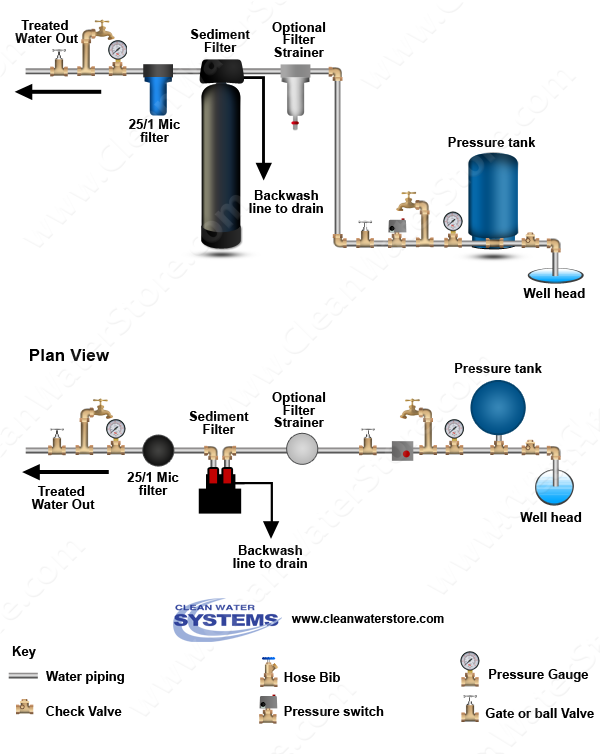 If the pressure tank were after the system, and the filter system went into a backwash, the well would not turn on because there is a check valve before the pressure tank to prevent the water from being discharged back into the well, and the pressure switch would not register that the pressure had dropped and the pump must turn on. If the check valve was down the well, or on the other side of the sediment filter, say on the inlet to sediment, when the sediment filter went into a backwash, the water would enter the sediment filter through the outlet on the sediment, not the inlet, causing it not to backwash and causing other problems. The pressure tanks have the in and out pipe (typically one pipe on captive-air pressure tank) on the direct bottom of the pressure tank, so usually no sediment will build-up in the tank. But in any case, there is no way to use a backwashing filter before the pressure tank. Also, say you wanted to use a cartridge filter instead of a backwashing filter system, and you placed a cartridge type filter before the pressure tank. After a while if this filter became plugged up, your well would not be able to shut off properly because the pressure on the inlet side of the filter from the well is much higher than the pressure tank pressure. This will cause the pressure switch to rapidly turn on and off and eventually cause damage to the well pump motor. Generally it is NOT a good idea to put any type of flow restriction such as a filter cartridge or backwash filter before your pressure tank and it is not necessary in any case because modern pressure tanks are lined with a special coating to prevent corrosion. Q. Can I run the drain line up and over the top of the Sediment Filter? My drain is in on the ceiling above the where I want to install it. A. Yes it is no problem to run the drain line up several feet higher than the top of the Sediment Filter tank, because the Sediment Filter backwashes under line pressure from your pressure tank and well pump system. Q. How much does it cost to ship it to me? A. No charge, shipping is free within the continental United States. Q. Do you ship to Canada, Alaska, Hawaii, or internationally? A. Yes, for an additional charge. We do ship regularly all over Canada, Alaska and many parts of the world at a discount over the actual freight cost. Please email us with your postal code and we will quickly give you the cost. Q. Can I get assistance in choosing a filter system for my application? A. Yes! You should first have your water tested, and then contact our technical staff for help on selecting the best iron filter system for your application. Also see our Custom Water System Design Questionnaire which makes it easy to help you select a system.